Mark Simpson on covering Ireland for the BBC, following Tony Blair’s last campaign trail, and aiming to achieve his sports stadium ambition. My first job was at the News Letter. I then went to the Irish News and then the Belfast Telegraph, before joining the BBC in 1998 as a political correspondent. I arrived just before the signing of the Good Friday Agreement so there wasn’t even time to hang up my coat before I started eating and sleeping at Stormont. In 2002, I became one of the Ireland Correspondents for network news, under the wing of the legendary Denis Murray. I then had four years based in Yorkshire as a North of England correspondent before returning to Belfast two years ago to take over from Denis when he retired. What does your role as Ireland Correspondent involve? The job has been described as ‘the fireman for the island of Ireland’. 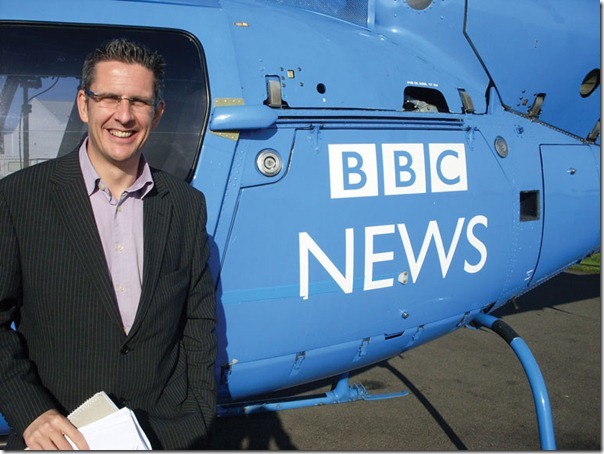 It involves covering breaking news north and south of the border for BBC network outlets. These include BBC Radio Five Live, the Today programme on Radio Four, the Ten O’Clock News and the BBC News Channel (previously BBC News 24). How has the job changed since you were first appointed? Two issues have dominated the news agenda here since I was appointed in the summer of 2008: The credit crunch and the rise in violence by dissident republicans. In many ways, neither issue was anticipated. How much interest do BBC audiences outside Northern Ireland show in the province? There are thousands of people from Northern Ireland and the Republic now living on the UK ‘mainland’. There is also interest beyond that group. Stories like the Bloody Sunday report have a historical significance, and attract a wider audience. Also, there is interest in how Ireland is handling its budget deficit, given that the UK is having to make similar tough decisions. What stands out as the most memorable story you have covered? 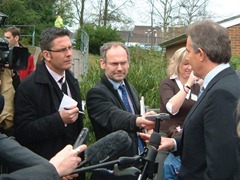 In 2005, I was part of the small BBC team on Tony Blair’s ‘campaign bus’ during the general election. It was 30 days criss-crossing the UK, watching Tony Blair try to win over the voters, in spite of the unpopularity of the Iraq war. I had a front-row seat of history as Blair became the first Labour Prime Minister to win three consecutive general elections in spite of his two wars – the one in Iraq, and the one with Gordon Brown (to be precise, I sat in one of the back seats of the bus, close to the toilet, but you know what I mean). Also on the bus was the BBC’s Royal Correspondent Nick Witchell, who like me was drafted in his from his normal job. What do you enjoy most and least about your work? The best part of the job is also the worst part – unpredictability. It is not a nine-to-five job. Breaking news has a habit of breaking in the middle of the night, especially in Northern Ireland. With the advent of 24 hour news, there is no escape – day or night – from deadlines. Needless to say, the stories which break in the early hours of the morning are usually bad news. And when it comes to death or destruction, reporters are usually running in when everyone else is running out. On the plus side, every day is different. By definition, news is interesting. Over the past two decades, I’ve covered everything from the popularity of botox in Barnsley, to marathon talks at Hillsborough Castle, to the police playing ice-cream van music to quell a riot in west Belfast. Swimming or cycling with my three daughters. Either way we get wet. I also have an obsession with sports stadiums, whether it be reading about them or visiting them.